Los Angeles Dodgers starter Josh Beckett will undergo season-ending surgery to relieve pressure on the nerves in both his neck and shoulder region, after experiencing tingling in his fingers following a throwing session on Friday. Beckett was originally placed on the 15-day disabled list in mid-May following a nerve entrapment in his shoulder that caused the Los Angeles starter difficulty in gripping a baseball. Due to such, the Dodgers shut down Beckett for four weeks as means to allow him to work his way back to the rotation in a slow and efficient manner. Although he was not expected to return prior to the All-Star break, Beckett and the Dodgers organization were optimistic that his nerve irritation would not require surgery; however, those expectations were thrown out the window on Saturday as the irritation has persisted too long for the Dodgers’ liking. 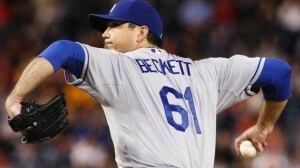 Prior to the injury, Beckett boasted an 0-5 record and 5.19 ERA in 43.1 innings of work over eight starts. After joining Los Angeles late last season as part of a blockbuster trade with the Boston Red Sox, Beckett pitched solidly across seven starts, posting a 2.93 ERA and 38/14 strikeout to walk ratio in 43.0 innings. Beckett is expected to recover in time for the start of spring training next season and is signed through the end of 2014 (his contract is worth $15.75 million for the 2014 season), wherein he will become a free agent heading into the 2015 season.